A team from Messiah Foundation USA set up their booth (905) at the Natural Living Expo in Marlborough, Massachusetts, on November 13-14. This is New England’s largest holistic event with 250 exhibits. There, Messiah Foundation offered visitors free spiritual healing and granted Invocation of the Heart. 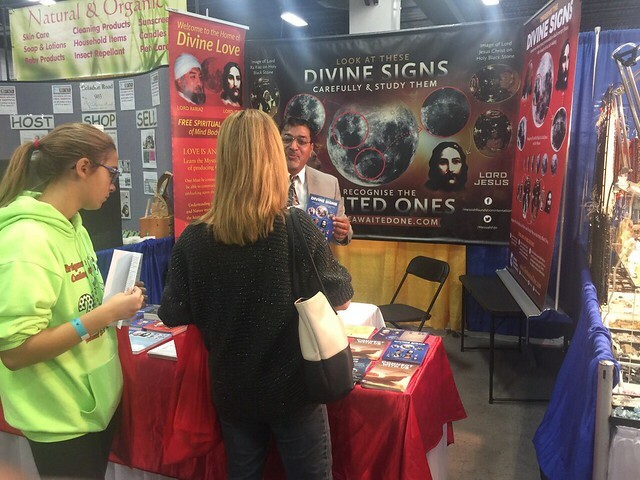 The expo was attended by approximately 9000 people who were very receptive to Lord Ra Riaz Gohar Shahi’s message of divine love. Our stall was consistently busy throughout the two days of the expo. The response from people was fantastic! A large number of aspirants were delighted to hear about the Awaited One. Our team also displayed a large banner depicting the images of Lord Ra Riaz and Lord Jesus on the Moon, Sun and Holy Black Stone. A vast majority of people heard our message attentively and showed their appreciation.